WOWCAST BLOG: Thrall Must Go Down! I landed in Azshara flight path at around 8:45pm last night. Technically, I rode into the flight path because my shammy didn't have it. lol. She had to ride down from Felwood. Ah the joys of rookie toons. Why couldn't they have retrofit all level 70 toons with all the FPs!? They did it for DKs at level 55. Needless to say, 17 wasn't enough to combat the forty plus horde who rose to Thrall's defense. We got to his chamber and had a boat load of elite mobs on us and were able to dps them down fairly quickly. However, wave after wave of horde showed up and completely annihilated us! This I think was our punishment for waiting until after Arena season started to do this raid. lol. They love their orc king lemme tell you! So we did a rez, ninja portal to Theramore and hit up Cairne Bloodhoof in Thunder Bluff. He was far easier of course as there were only two level 80 horde who came to his defense. Then we hit up Lady Sylvanas Windrunner in Undercity and Lor'themar Theron in Silvermoon City. They all went down without much ado. Lady Sylvanas tried her best though. She has this annoying habbit of dropping target and teleporting around her platform. Neither of these guys had many horde come to their defense. 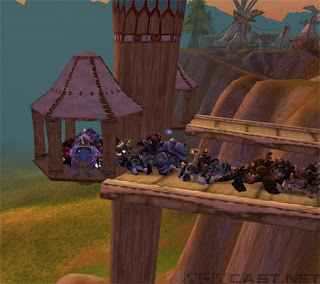 Only about five horde tried to keep us off their beloved leaders. We just kept the pvp-savy players in the back to deal with them. We were able to get the [Wrath of the Alliance] achievement though although we had to hunt for two additional horde to kill in Silvermoon City. After we finished up in Silvermoon City, we decided to cruise LFG, Trade, and General Chat to try and gain more numbers for Thrall again. We got about 10 more players and half were 71 or 72. We seriously thought we had a shot until we rode into his chamber and even MORE HORDE showed up this time. So now I'm using http://www.timezoneconverter.com/ to plot out the best time to raid Ogrimmar. I'm going to push 2am Australian time as a lot of Aussies play on this server. That would make it a 7am raid our time. hahaha. MAN, the things you have to do in the name of taking down Thrall on a crazy horde-ridden pvp server. I don't even care much about the [Reins of the Black War Bear] so much as I care about having finally raided all of the horde cities. :) Victory shall be mine!